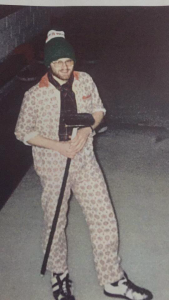 Bet you he still has those jammies…..
W… T.. F…? is the only phrase that covers this photo of one of Ireland’s finest senior statesmen in his carefree youth….. Waiting for some sort of explanation from the Past President – should be worth waiting for. Quiet time for the website just now, or at least until Eoin and Clare arrive in Hollywood, to guest star with Katie and the rest of the Bond Girls. But…..I am now the custodian of the ICA archives with photos that go way back to the early 1990s. So look out for some of the very best ones appearing from time to time.